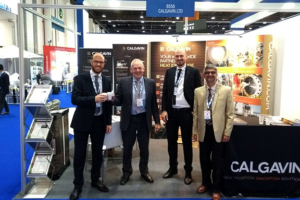 For over 35 years CALGAVIN has steadily built up an unrivalled expertise in the thermal design, operation and analysis of heat exchangers used in the process industries. The company’s engineering team have gained extensive knowledge of thermodynamics, heat transfer and fluid flow phenomena, combined with global experience providing improvement solutions to hundreds of plants worldwide. The company was founded on the development and sale of the tube-side heat transfer technology hiTRAN Thermal Systems. This success has led to the broadening of the company’s activities to provide a wide range of solutions, products and services all focused on heat transfer optimisation for process plants, minimizing energy use, capital investment & maintenance costs. Our direct and indirect clients include the global oil and gas companies, petrochemical manufacturers, offshore industries and international plant contractors. Our success to date has been directly proportional to the company’s investment in research. Re-investment of its profits is a very considerable proportion of turnover each year. It is intended that this will continue thereby ensuring security and success of future expansion plans. CALGAVIN now has the opportunity to embark on a more comprehensive strategic business plan than in previous years. Its strong global position in the market place now allows the company to introduce new related products, services and solutions to its existing markets and expand into potential new ones.